A SHIPMENT of unwanted books and furniture from schools across Inverclyde has been sent to the Caribbean. 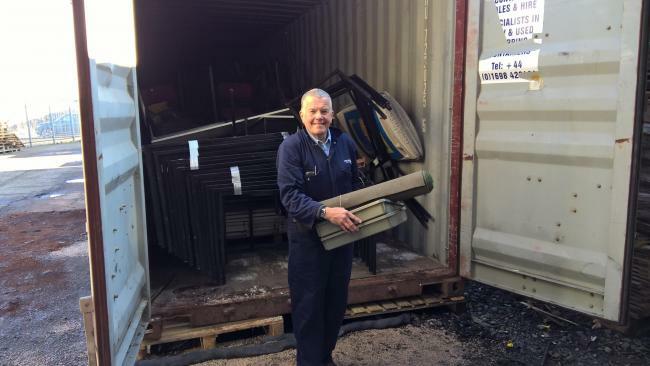 Retired schoolteacher David Miles-Hanschell loaded up the final items into a container headed for Grenada at Greenock Ocean Terminal. They are being sent by David via his charity Surplus Educational Supplies Foundation (SESF), which was was founded 11 years ago to assist in the aftermath of the Hurricane Ivan disaster in Grenada. He told the Tele: “It has taken the best part of five years to see this shipment of educational resources from Inverclyde Council schools and James Watt College collected by janitors and staff and teachers from Glenburn School, Sacred Heart and St Michael’s primary schools to mention a few on its way. “I thank the good folk of Inverclyde. “Thanks must also go to port manager Andrew Hemphill and the team at Peel Ports Clydeport Ocean Terminal who were patient with me beyond the call of virtue. They deserve a lot of credit.